Wandel International Nigeria Limited, a flagship company of the Simba group that is home to some of Nigeria’s best-loved brands, distributing TVS India Ltd, motorcycles and tricycles was in Kaduna, Northwest, Nigeria to offer free medical services to its numerous customers. This service started on Tuesday with free doctor consultation for blood pressure and diabetic condition for over 3000 tricycle riders in the state. 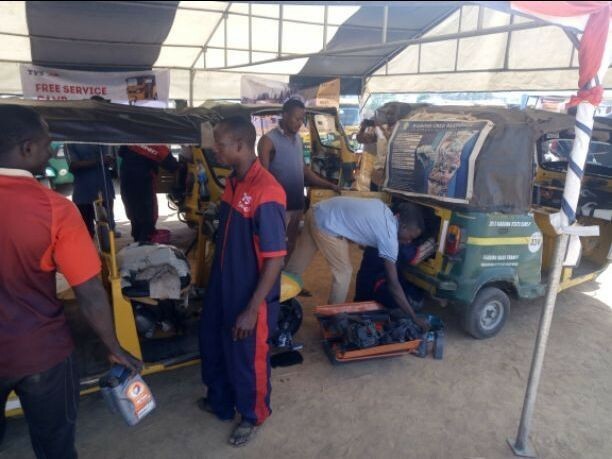 The marketing comoany was doing this as part of event making up the company’s 3-day free diagnosis and repairs of ‘TVS King’ made tricycles in Kaduna State. One of the beneficiaries of this value added service, Salma Ibrahim described the initiative as a welcome development. Ibrahim was of the view that, the company, which has sold thousands of tricycles in Kaduna within the past five years had only come to thank its customers. “I’m sure this is a good marketing strategy. This means the company put its customers at heart especially we here in Kaduna. This free doctor consultations and repair of our tricycles would be in our mind for long time”, he said. Earlier at the venue of the mega free checkup camp where the company engineers are expected to attend to more than 3000 tricycles operators, representative of the company in Nigeria, Manish Rohtagi, highlighted the need for tricyle operators know their blood pressure and diabetes level. “Ddiabetics is one of the most common diseases and as operators who are always on the road under intense pressure from other motorists and commuters, it is important for their health to be in good shape. “End-users’ training on safe driving and keeping their vehicle fit, training of mechanics with free tools distribution. This Mega event will give the opportunity to improve technical skills of the mechanics, reduce maintenance costs for riders. “Over the years, we have launched many empowerment programmes. To date, we have trained more than 5,000 mechanics Pan-Nigeria, distributed 3,000 special tool-sets, which resulted in thousands of job creation. “At the heart of our value proposition is a commitment to quality and service the vehicles. Commending the efforts of Simba Group, Assistant General Manager, Kaduna State Traffic Law Enforcement Authority (KASTLEA), Umar Umar, said the initiative was a welcome development in the state.